The Vector Network Analyzer MVNA-8-350, which is produced by AB MILLIMETRE since 1990, is the only all-solid-state electronics millimeter and submillimeter waves spectrometer/network analyzer, which allows to do vector measurements (simultaneous measurements of both, the amplitude and the phase of transmitted/reflected signal) over very broad frequency range extending from 8 to 1000 GHz (wavelengths from 4 cm to 0.3 mm). 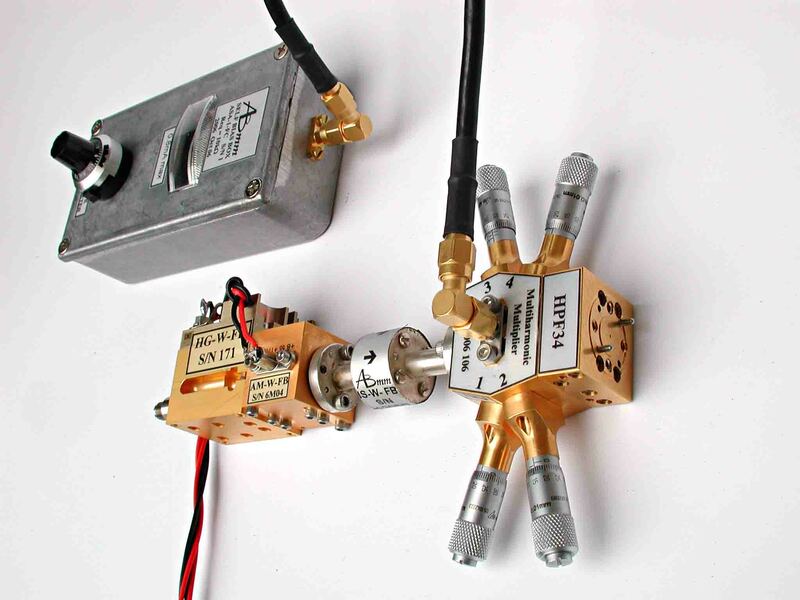 It is the state-of-the-art millimeter and submillimeter domain diagnostics and spectroscopy tool, for many applications, from space telecommunications and satellites diagnostics, to physics and chemistry spectroscopy. Over 60 MVNA's are in use in civilian sector at present. 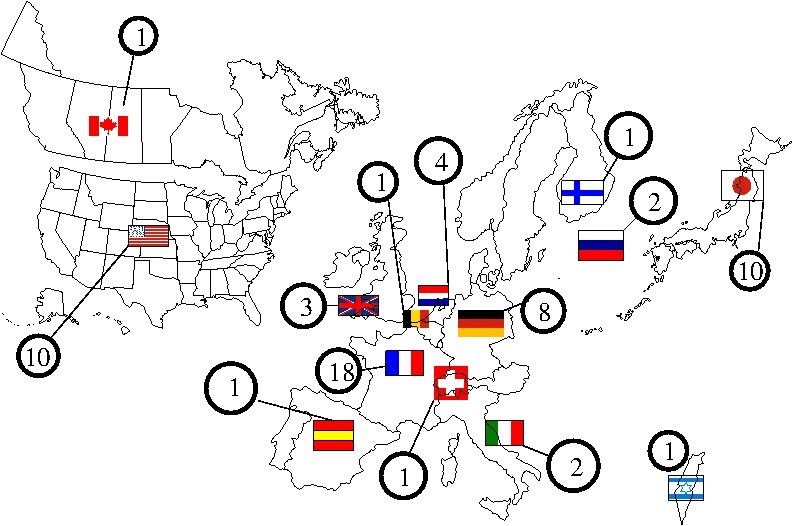 A symbolic map shows worldwide distribution of our MVNAs. The numbers in circles show how many AB Millimetre Vector Network Analyzers MVNA 8-350 have been sold in each country since 1990. Our MVNA is based on an original, patented, design (CNRS France 1989, US Patent Goy-Gross 1992). According to this configuration, experiments are possible even without directional couplers. This explains the fact that millimeter heads are small and light. Except for the lowest frequency band, from 8 to 18 GHz which works with coaxial cables, all higher frequency bands use such small waveguide millimeter heads. The above figure shows millimeter heads for standard microwave bands from 18 to 110 GHz. Our unique design explains also the extremely high frequency capability, where directional couplers don't exist. A single pair of extensions, see following two pictures, permits the continuous frequency coverage from 140 to 1000 GHz. The figure above shows ASA-1-FC extension (Automatic Source Association Number 1- source side - Full frequency Coverage). The six times multiplier is fed from the MVNA with the centimeter range wavelength microwaves through an SMA coaxial connector (on the left), providing millimeter waves output signal in the frequency range of 62-112 GHz. That signal is subsequently amplified and sent, through a Faraday isolator, to the tunable harmonic multiplier, TMU. The choice of the driving signal frequency, of the multiplication factor (between 2 and 10), and of the attached high-pass filter HPF, provides the full frequency coverage in the range between 140 and 1000 GHz. Electronically controlled frequency sweeps with a minimum span of 9 GHz are possible in the whole range. ASA-2-FC extension (Automatic Source Association Number 2 - detection side - Full Frequency Coverage). This setup is rather similar to the ASA-1-FC source (previous picture). It does not include millimeter wave amplifier, and the tunable detection device SHM is a Schottky Harmonic Mixer. The bias tee on the top of SHM provides a separation of the DC bias current from the IF detected beat signal. 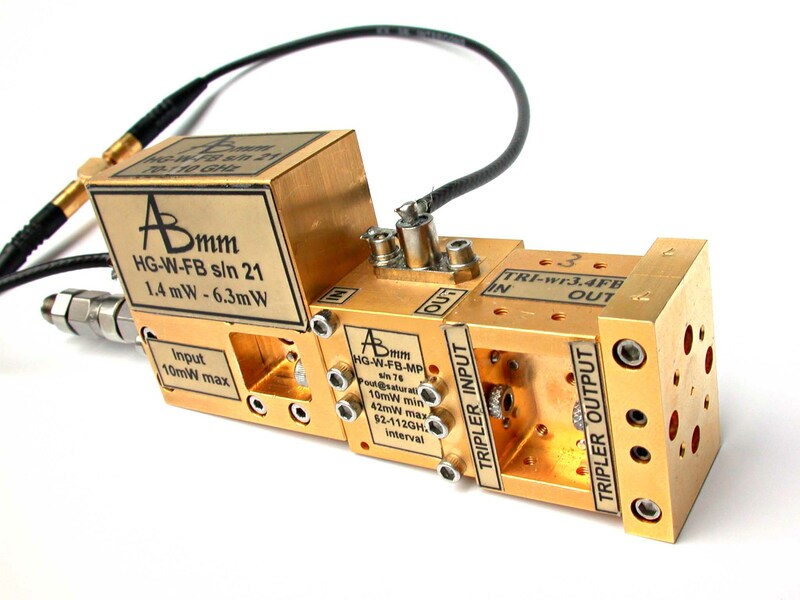 ASA-2-FC is used to detect signals generated by ASA-1-FC in the frequency range from 250 GHz (the cutoff frequency of the input waveguide) up to 1000 GHz. Such a broad selection of available sources allows us to cover the whole spectral range from 8 GHz to 1 THz. The diagram below shows the list of available MVNA sources above 29 GHz, together with their frequency range and typical output power. For details see our product description Picture 16. Those sources, combined with our choice of detectors provide very broad dynamic range of MVNA, a figure of merit which is usually more significant that the source power itself. Large DR is particulary important for experimental set-ups or DUT introducing considerable losses into the radiation path. In such situations MVNA, due to large dynamic range offers comfortable and meaningful S/N ratio making data collection faster and more reliable. In the diagram below we plotted the DR for several typical source-detector (described in detail in our Products description section) combinations. The observed dynamic range decreases with frequency, as shown in the picture above. For details please see our Products description Picture 16. The standard VNAs are dedicated to the 4S-parameter measurements. On the contrary, most applications of AB MILLIMETRE's MVNA are with a single detection at a time (1S), model MVNA-8-350-1, or with simultaneous transmission-reflection (2S), model MVNA-8-350-2. The full-reverse 4S-parameter configuration (model MVNA-8-350-4) is very rarely needed. On the other hand, an original configuration of the MVNA, model MVNA-8-350-1-2 (and also models -2 and -4), makes possible to work, with a single source and a single detector, at two frequencies simultaneously, like 51 GHz and 68 GHz, or 500 GHz and 600 GHz, etc. The MVNA is used at present in several research laboratories, and at universities. Two main kinds of application of MVNA can be distinguished: engineering studies of millimeter waves devices, and millimeter-submillimeter spectroscopy. The first group of applications is prevalent at Electrical Engineering departments, developing microwave and infrared techniques. Faster electronics circuits and faster transmission lines require higher bandwidth, hence need to develop and optimize faster active and passive electronics, electrooptical devices, and diagnostic tools. MVNA is the best possible tool for testing of millimeter wave antennae, for network analysis of broad-band high frequency components, and for materials characterization. 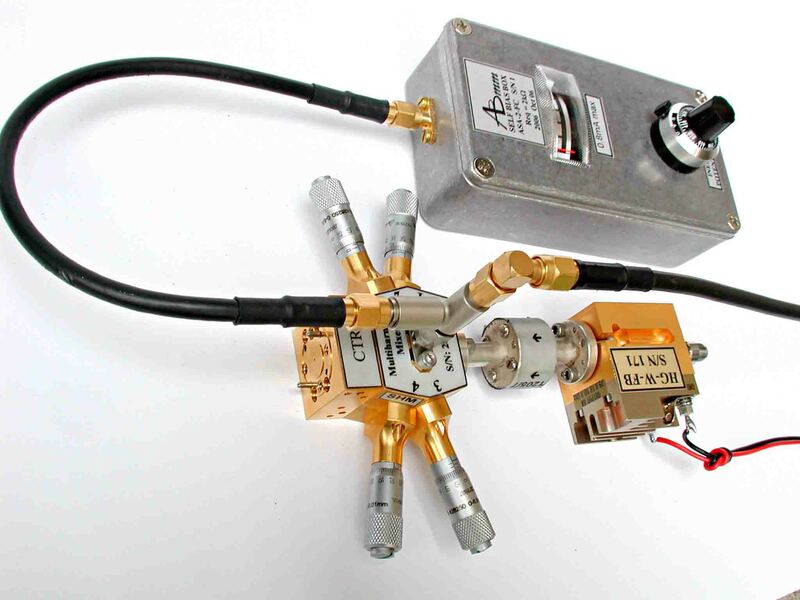 That type of applications is also common at physics departments, where millimeter wave instrumentation is used as a detector, like in radioastronomy, as a diagnostic tool, or as a powerful heating source for instance in plasma fusion physics. In the above plot the measurements of an angular antenna diagram of a scalar (corrugated) horn are shown for the frequency of 175 GHz. The antenna under test, attached to the detection unit, is rotated over the range from -90 ° to + 90 ° from the optical axis of the source, which is located in the "far field" conditions. The amplitude scale of the signal is shown in dB on the left side of the plot. The phase scale, in degrees, is shown on the right. Green curves correspond to the rotation plane parallel to the electric field vector E of the millimeter wave. Red curves correspond to the rotation plane perpendicular to the electric field vector E of the millimeter wave. Please note that the phase data are shown, for clarity, upside-down. The above diagram demonstrates that the antenna has almost perfectly symmetrical Gaussian beam characteristic around the optical axis and very small side lobes. The phase response is flat (due to locally plane wave) and the amplitude angular dependence is parabolic for small angles on the logarithmic (dB) scale. Such response is expected for the Gaussian beam since the intensity of the radiation I decreases with the distance from the optical axis a like I ~ exp(-a*a) . The picture above shows printout of diagnostic measurement of a "monopulse" antenna, used for guidance systems, obtained at 94 GHz during a 20 sec. angular sweep. The amplitude is shown in the upper and the phase in the lower part of the figure. Two pairs of waveguides from the antenna are combined in order to obtain both, the sum (shown in blue) and the difference (shown in red) signals. The "sum" response corresponds to the ordinary angular antenna diagram for a Gaussian beam, as shown in the previous picture, with a parabolic shape of the amplitude and a flat phase response close to the axis of symmetry. The "difference" signal displays a sharp local minimum of the amplitude and a step-like response of the phase. Such a characteristic is useful for guidance applications where the feedback system attempts to keep the antenna oriented at the maximum of the "sum" signal, and uses the sign of the "difference" signal phase for the track correction. The photo above shows microwave antennae, used for coupling of the free-space propagating radiation to the waveguide in the range between 100 - 600 GHz. Such antennae are small and efficient. Each of the four pairs of scalar (corrugated) horns, provides a very clean Gaussian beam over wide frequency range. The emitted Gaussian beam can be refocused in a Quasi-Optical bench with 4 elliptical mirrors, see the previous and the next pictures. 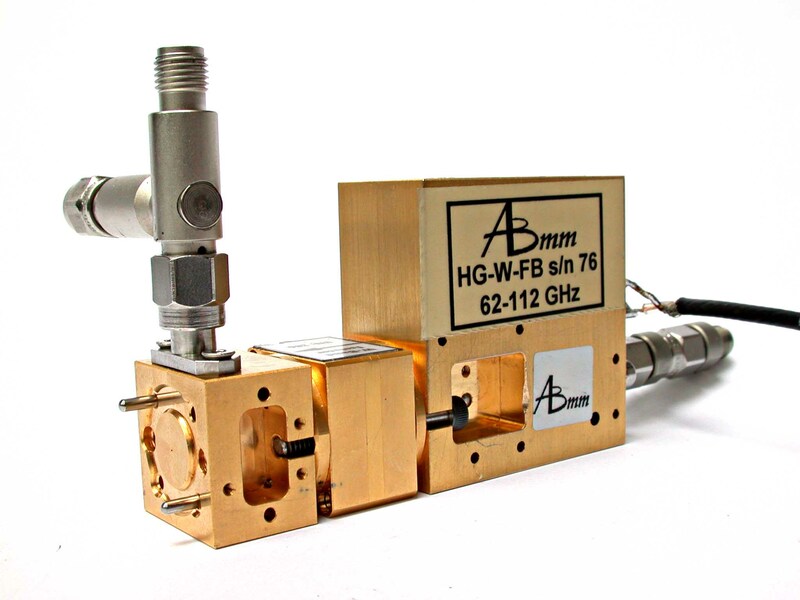 A new 5-mirror 44-1000 GHz QO bench allows simultaneous transmission and reflection measurements without using of directional couplers, thanks to polarizing grids. In the system shown in the photo above, a quasi-optical bench is used for transmission (T) - reflection (R) characterization of dielectrics in the range 44 GHz - 260 GHz at the Electrical Engineering department, Signal Theory and Communication, Microwave and Millimeter Waves Group of Universidad Publica de Navarra in Pamplona, Spain. (Picture: courtesy of professor Mario Sorolla, UPN, Pamplona). The above picture shows MVNA-measured data of high-loss material. The amplitude, in logarithmic scale, of transmitted signal (left scale), and the phase (right scale) vary almost linearly with the frequency. 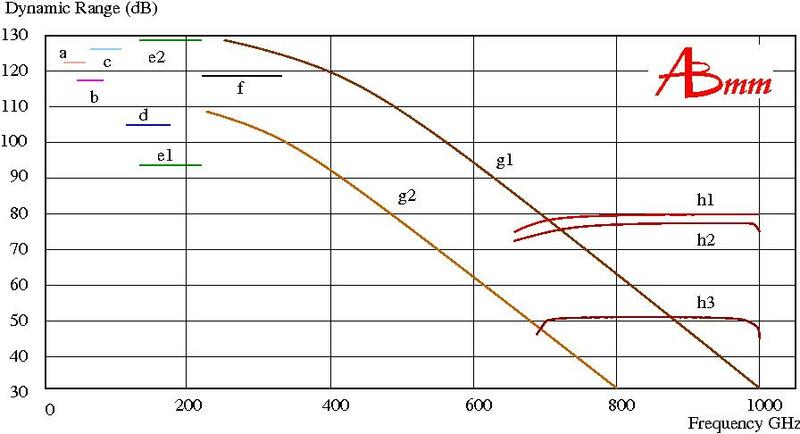 Transmission T and reflection R versus frequency of a plane-parallel 2.79 mm thick slab of low-loss material. It shows characteristic Fabry-Perot resonator-like oscillations of signal amplitude (left diagram). T has a maximum where R has a minimum, and vice-versa. The software fitting of T (thick lines) gives precise values of the permittivity e'=3.17, and the loss tangent=0.007 in the whole spectral range, 40 GHz - 170 GHz. 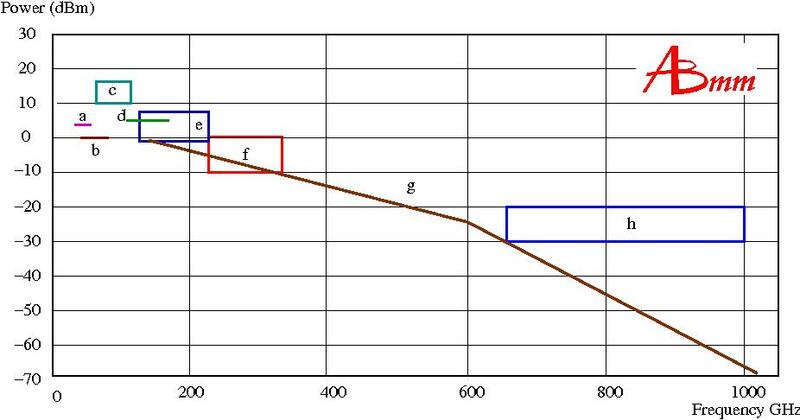 The amplitude of transmitted T (thick line) and reflected R (thin line) signal is shown for measurements of the 2.56 mm thick ferrite slab (not magnetized) between 40 and 170 GHz. There is a very strong absorption band observed between 55 GHz and 73 GHz. Introducing a sample (a 1.92 mm thick sapphire slab) into the cavity shown at the previous picture shifts resonance frequency and damps the resonance. From these changes of frequency and cavity Q-factor dielectrics parameters of the sample can be calculated. The diagram above shows traces of the resonance of empty cavity, and of the cavity with the sample. Signal amplitude scale in dB is shown on the left, and the phase in degrees on the right. From measured changes of the resonance shape and position (shown in polar coordinates in the right part of the picture) one can calculate dielectric parameters of the sample. The second group of applications of MVNA is commonly related to research in Science Departments. That research includes radioastronomy and plasma fusion as mentioned above, but also spectroscopy of molecules and atoms, studies of elementary excitations in condensed matter, physics of metals and magnetic materials, and studies of magnetic resonances. In particular, in several leading high magnetic field laboratories worldwide, MVNA is intensively used for electron paramagnetic resonance, and cyclotron resonance studies . An unique feature of MVNA - very broad frequency coverage allows for rapid measurements of magnetic resonances at several different frequencies corresponding to a broad range of magnetic fields. For example, at the National High Magnetic Field Laboratory, in Tallahassee, FL, USA., there are already four MVNAs which are used for a broad scope of experiments, and in particular for variable frequency magnetic resonance studies. Thanks to the dual-frequency technique it is possible to scan at 18 different frequencies (each point in the picture corresponds to one magnetic field sweep which takes approx. 15 minutes) in the 257-715 GHz interval with one of the MVNA's, in less than four and half hours. J. Liu, S. Datta, E. Bolin, J. Lawrence, C.C. Beedle, E-C Yang, P. Goy, D.N. Hendrickson and S. Hill, Anisotropic exchange in a tetranuclear CoII complex, Polyhedron 28, 1922-1926 (2009). Copyright © 2013 AB Millimetre, All Rights Reserved.